If you played Image & Form’s SteamWorld Dig then chances are you’ll be in agreement that it was hard to fault. 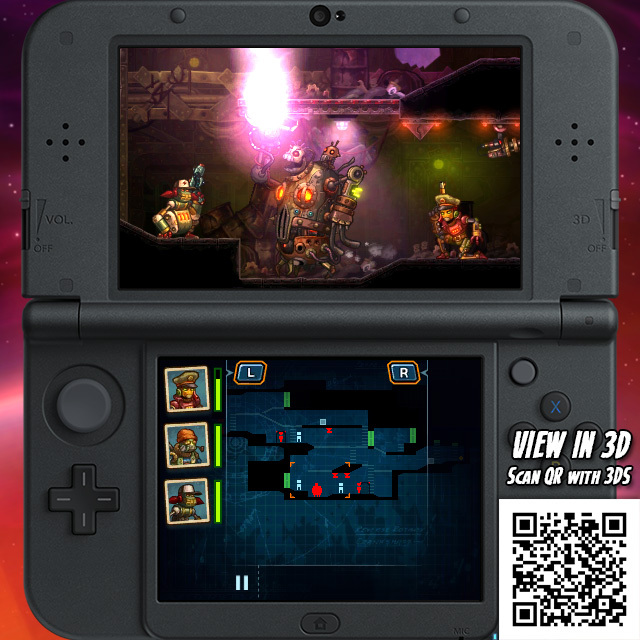 SteamWorld Heist follows suit – it’s one of those rare games that’s hard to criticise without resorting to nitpicking. The amazing thing is, SteamWorld Heist isn’t a simple case of more of the same – it’s a completely different, and much longer lasting, experience. This 2D tactical shooter is merely set in the same universe; a universe full of delightfully dorky steam powered robots. Or steambots, to use the correct terminology. Captain Piper and her crewmates took to stars in search of valuable water supplies after their homeworld was destroyed. She’s no robotic Robin Hood – she’s a smuggler who sneaks onto ships, steals the crew’s loot and often makes a hasty getaway while all guns blazing. The first chapter focuses on finding out why enemy activity has increased in the vicinity. Scrappers, as they’re known, have been giving the local moisture farmers grief and as such Piper is promised a handsome reward for turning them back into scrap. Formed from old boilers and whatnot, the Scrappers are first of three enemy factions Piper comes across, with the other two making an appearance in the remaining two chapters. Each has different unit types and a head honcho to defeat, which works wonders in keeping things both focused and fresh. The Scrappers go down easy, making them ideal target practise while learning the ropes. Being a turn-based shooter and all, the idea is to move your crew members one at a time before selecting an attack and taking aim. And yes, it is possible to skip character movement animations. Vanguards – such as Ivanski, the stereotypical Russian circus robot – can cover great distances while others have a restrictive field of movement. Blue tiles are used to display areas that can be moved to while vantage points for attack are shown in orange. Breakable boxes, barrels and shields meanwhile provide defensive cover. Invaluable cover at that – it’s unwise to leave a robot out in the open, especially after filling nearby opposition with hot lead. 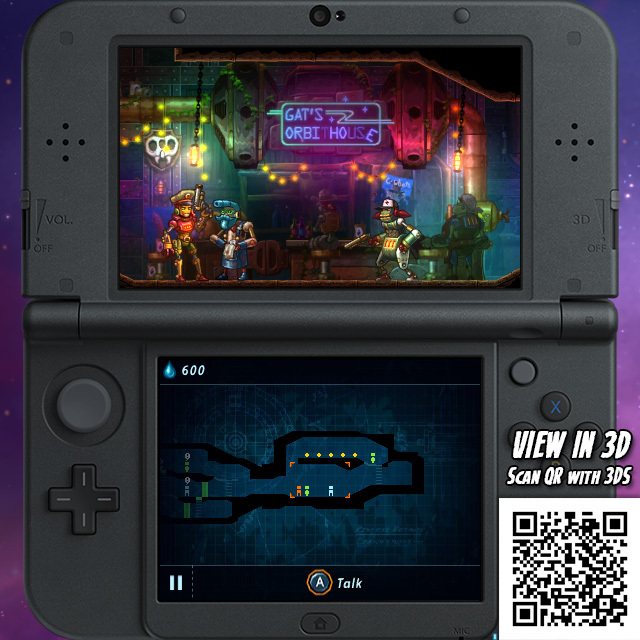 Gunplay is SteamWorld Heist’s forte; something that has clearly been refined and honed to perfection. Piper starts out with a weak but accurate laser-sighted pistol which plays a key role in the learning curve, allowing you to get a feel for the physics before moving onto non-sighted weapons. It’s the epitome of excellent game design. Indeed, this is a game that requires skill rather than luck. Over time you’ll see great improvements to your shooting skills, bouncing bullets off walls and ceilings to land a perfect headshot. This is, of course, immensely satisfying. The way enemies explode into a shower of scrap – complete with the occasional, gratuitous, slow-mo effect – plays part in this too. Piper’s crew quickly starts to expand to a whole host of ragtag steambots, each with their own skill set, preferred weapon type and distinct personality. Through use characters level up, becoming stronger and gaining new skills. Some steambots request payment to join your cause while others require a certain amount of stars, with most missions having a maximum of three to earn. Generally speaking, returning home with a full party and not one bag of swag left behind is enough to earn a three star rating. Missions last around 10-15 minutes each and mostly take place in randomly generated enemy spacecraft. Objectives vary from one another, but not massively so. Some require you to search high and low for loot before rushing to an evac pod, while others focus on destroying all enemies before retrieving an item of importance and heading home. Later missions introduce countdowns. Once they reaches zero either re-enforcements or stationary gun turrets are deployed. Worry not – they don’t have to be dealt with prior to escaping. The casual difficulty setting is precisely that – just the right side of challenging. Opt for a higher level of difficulty and you may end up sitting in an escape pod with fewer comrades then you started off with. Thankfully their demise is temporary – they’ll be back on their feet in time for the next mission. Piper is usually joined by two other companions of your choosing who can be kitted out with single-use grenades, side arms, health packs and other gadgets. Additional side-missions meanwhile entail going in alone – ideal for boosting the experience of a crewmate that’s starting to lack behind. If you start picking favourites this is something bound to happen. Because you’re occasionally forced to sell items in order to make room for recently acquired swag, inventory management plays a small part in the proceedings. You may have to mull over what items to sell and what to keep now and then, but not too often. Additional inventory slots can be purchased from the numerous shops and bars found on the map screen. New hats too, including the grin-inducing ‘hat in a cat’. Who would have thought that robots hold headpieces in such high regard? As mentioned earlier, each of the three factions has unique enemy types. These include shielded enemies that can only be damaged from behind and units that can perform devastating melee attacks. Enemy AI is generally robust; every now and then they’ll catch you off guard by reflecting a shot off a wall. Smarter enemies will also aim for your legs in order to incapacitate for a turn while the weaker, stupider, enemies have the occasional habit of opening fire while stood near explosive barrels. Boss battles feature as well, and always put up a good fight. The last boss in particular allows little leeway for error, forcing you to make every shot count. You could argue that SteamWorld Heist is rather basic when compared to other turn-based shooters, but it’s within its simplistic nature that accessibility lies. This is something that can be enjoyed by all and sundry; a game that’s just as inviting as it is compelling. The third and final chapter may have benefited from a trim – by the time the last couple of missions rolled around, things did start to become a little predictable – but we’re literally talking about just two or three 15 minute missions here, not some unwanted hour or so of filler. SteamWorld Heist is due on a wealth of formats next year, but we’re already willing to bet that this handheld iteration will remain the definitive version. It genuinely feels as if both the 3DS’s limitations and virtues were taken into careful consideration during development. The map on the touch screen proves incredibly helpful while the sprites and backdrops are sufficiently detailed. That’s to say, they have just the right amount of detail – we’re rather fond of the way that the steambots close one eye while lining up a shot. Audio impresses too, with many of the bars and shops featuring ‘live’ bands. As eShop games go, only Nintendo’s own efforts are as slick and polished. I think we can all agree that’s the biggest complement anybody could ever give.